And yet, I've already forgotten what I played on the show. Good thing I keep these playlists, isn't it? We go! Thanks, too, to everyone who contributed to the KUCI fund drive the past two weeks! Artist                       Title                         Album                      Genre    New? Darkling Eclectica, Episode 1727: Fund Drive! KUCI's fund drive leaps upon us! 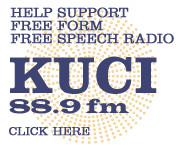 Feel free to leap right back at it by making a pledge of at The KUCI Donation Page! Artist                        Title                        Album                      Genre     New? Find Drive! Fund Drive! Fund Drive! Is going on even as I type this! Give us a call or click on the above, and you'll be able to do your very own part to keep KUCI KUCI-ing!